Since time immemorial, hair loss has been a reality that people had to face. A form of a natural disaster with no obvious solutions or treatments. It is only in the recent decades that effective hair restoration practices have been formulated. Chief among them is the FUE hair transplant procedure. FUE is a non-invasive surgical procedure in which the surgeon extracts individual follicular units from the donor area and implants them into the zone of hair loss. It's a very effective hair restoration technique that reverses hair loss instead of just slowing it down or stopping it. But before you consider undergoing the surgery, there are a number of things you should know. 6. How many grafts should be done per day? There is no set age for an FUE hair transplant. However, an important consideration that seems to accompany age is the possibility of future hair loss. A balding or receding hairline can occur at any stage in life, mostly affecting men and woman in their late thirties and older. Unfortunately, most men usually start to lose their hair in their early twenties and in extreme cases, their teens. 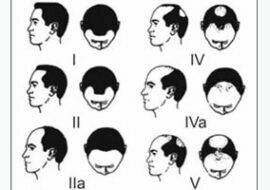 The hair loss gradually worsens over time and the final picture varies considerably depending on genetics. Male pattern and female pattern baldness, also known as androgenetic alopecia, are both hereditary forms of hair loss. Androgenetic alopecia owes its existence to an inherited sensitivity to the male hormone dihydrotestosterone (DHT). This hormone adversely affects hair follicles and causes a process called miniaturisation. This process causes certain hair follicles to reduce in size with each successive hair cycle. The end result is thinning hair and balding. The sensitivity to DHT differs from person to person which in turn affects the pattern and degree of hair loss. 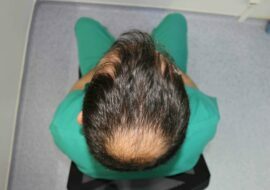 Androgenetic alopecia can range from something as innocuous as a slightly receding hairline to a completely bald head. Therefore, if you happen to undergo a hair transplant at a young age, there's a very high probability that the hair loss will continue. This makes the hair transplant futile since you also have to treat any future hair loss that occurs. Consequently, we prefer to perform the procedure on clients at the age of 25 and older since it's easier to predict the eventual pattern of hair loss. Once we have an idea about the future hair loss, we can customise an FUE hair transplant to address both current and future hair loss. The same cannot be said for patients below the age of 25 years. Fortunately, there's some good news. Our refusal isn't absolute as there are other considerations to make such as family history and medications against hair loss. If the patient is taking effective hair loss medications like finasteride and their parents show no evidence of substantial hair loss (Norwood scale 6-7), then we can consider the patient. Some men start having a receding hairline at a very young age and they aren't content to wait till they get completely bald. It's a difficult situation for them and refusing such patients on principle isn't the prudent choice. They will probably do it anyway in unscrupulous clinics with shoddy results. Our policy is to assess such cases individually before determining the way forward. We inform the patient about the risks involved and make a plan for the worst case scenario. Finally, we perform the surgery if really needed. The donor area is where the surgeon will extract hair follicles for implantation and is a major determinant of the outcome of the procedure. Appropriate donor areas for hair transplantation are those that maintain permanent hair coverage for a lifetime. That way, the hair also remains permanent once transplanted into the recipient area. The back of the head contains dense hair that is resistant to the effects of DHT and able to withstand the balding process. 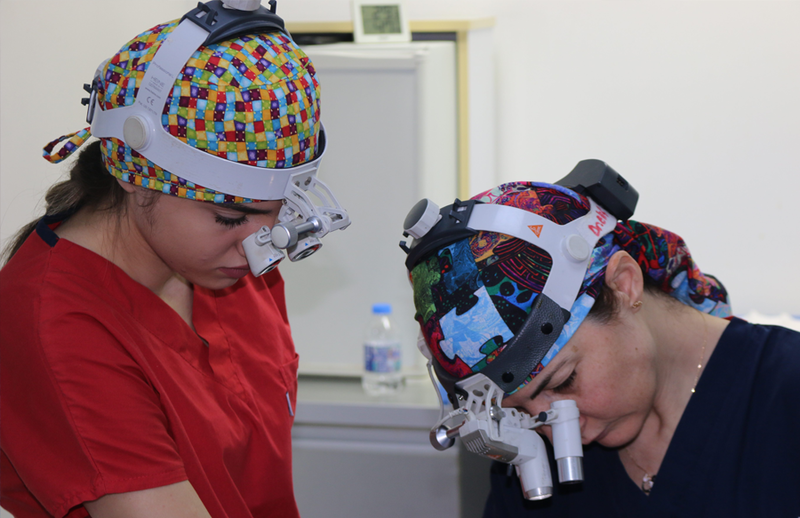 As a result, it is the best donor area used for hair transplantation. Other viable donor areas include beard hair and body hair (chest, legs, arms and pubic region). However, any hair transplanted retains its original characteristics. That means that body hair and facial hair will retain their colour, curliness and thickness. All these characteristics can be very different from the normal scalp hair. This is yet another reason why surgeons prefer donor hair from the back of the head. Other donor areas are mostly considered when the back of the head is insufficient or unsuitable. A good clinic will talk about your donor reserves upfront and give you accurate information once the surgeon has met you and analysed all donor areas. A normal donor area will provide around 4000 – 5000 grafts in total. If required, more grafts can be extracted but you'll have to contend with some inevitable thinning in the donor area. Ensure that you select a highly qualified surgeon in order to avoid excessive scarring. The surgeon has to perform meticulous manual extraction of hair follicles and use the right punch tool. On the other hand, a cheap clinic with unqualified surgeons and subpar equipment may perform the extraction poorly using cheap motorised tools. This may result in overharvesting of the donor area. A rushed extraction of a large number of grafts within a short period of time causes overharvesting which damages the donor area and limits the possibility of future procedures. A depleted donor area will have trouble growing hair and is full of scars, giving the unmistakeable appearance of a FUE hair transplant gone wrong. No amount of money will completely restore a depleted donor area. You therefore have to think very carefully about the hair clinic you choose and the quality of the service provided. Consider whether or not you can live with a poor result and destroy any hope of a correction because of a depleted donor area. Follicular Unit Extraction (FUE) and Follicular Unit Transplantation (FUT) are largely similar; the only difference occurs in how the follicular units are extracted from the donor site. In FUT, the surgeon cuts out a strip of skin from the back of the head them extracts individual follicular units from this strip of tissue via microscopic dissection. On the other hand, the FUE hair transplant procedure involves individual removal of the follicular units from the donor area by punching very small holes over a wide area of the scalp. The end result is that there's hardly any scarring as compared to the large scar left after a FUT procedure. FUE also requires a very short recovery period allowing the client to quickly resume normal activities. In this day and age, there's no longer any reason to undergo a FUT hair transplant. 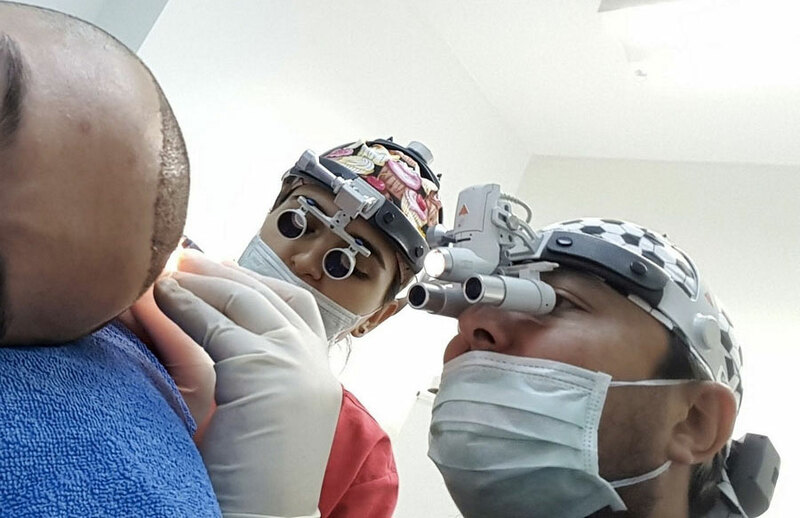 We now have the ability to treat almost any patient with a combination of FUE, Body Hair Transplantation (BHT) and Scalp Micropigmentation (SMP). Even the popular method of first undergoing an FUT then FUE later on can't compare. Some clinics use this technique to maximise the amount of grafts harvested from the donor area. In theory, FUT provides a high yield of follicular units since they are carefully harvested through dissection of a strip of skin. The surgeon uses these follicular units in the initial session(s) then switches to FUE in subsequent sessions for final touches or even to hide the resulting FUT scar. In practise, this technique isn't always a given. FUE on a virgin scalp is always easier than after an FUT procedure. The directions of the hair follicles beneath the skin can also change after an FUT. This makes the subsequent FUE more difficult since it increases the chances of transecting the hair follicles during harvesting. All in all, the superiority of FUE over FUT is self-evident. You have no guarantee that the scar formed after FUT will be small and easily hidden. You also have to contend with a lot of pain and increased risk of complications during the surgery. So if it's a choice between FUT and FUE, there's really no choice. You should even ask any surgeons that recommend FUT if they would be comfortable undergoing the procedure themselves. The answer may surprise you. Nothing worth having ever comes cheap, and this applies to hair transplants as well. Just think about all that has to go right for an FUE hair transplant to be successful. The surgeon has to carefully harvest individual follicular units without damaging them in order for them to be viable once implanted into the recipient site. All the while, the surgeon requires adequate judgement to avoid overharvesting the donor site. The implantation of the hair follicles also has to be done painstakingly to ensure they will later grow and that they resultant hair growth will resemble the natural hair pattern. That means that surgeon has to factor in the spacing and direction of the hair follicles during the procedure. All of this makes FUE a gruelling task that requires intense focus, expertise, patience and artistry. Number of grafts required. This is one of the main factors that decides the overall cost of the procedure. Consequently, it not rare to find clinics charging their clients sorely based on the total number of hair grafts transplanted during an FUE hair transplant. The amount of hair loss the client seeks to restore is what typically determines the number of grafts needed to complete a hair transplant. A client with extensive hair loss of NW6 and above will obviously have to pay a lot more money than one fixing a slightly receding hairline. The number of sessions. This factor is particularly important for those who are seeking to resolve advanced stages of hair loss. In such cases, more sessions will be required to cover all the regions of hair loss. The extraction of hair grafts is slow and time-consuming hence procedures needing large amounts of hair grafts will have to split into multiple sessions for efficiency and convenience. However, doing so leads to increased expenses due to logistics like additional medication costs and administrative costs. Many sessions can even end up doubling the final cost when compared to a single session. Harvesting method. How the surgeon harvests the grafts also plays a role in the costs sustained. The harvesting method in FUT is less labour-intensive than in FUE thus making it a lot cheaper. This disparity can even occur when the hair follicles are harvested differently during an FUE hair transplant. Some clinics use automated tools to harvest grafts while others perform this task manually. Automated tools reduce the amount of work hence lowering the costs. Sadly, there’s a downside – they increase the chances of overharvesting and scarring of the donor areas. Clinic reputation and quality. Even when all other variables are in line, prices across clinics may still differ. Clinics with a stellar reputation and a history of consistently good results are the most popular out there. They therefore have the luxury of charging higher prices. The converse is true for less reputable clinics. Keep in mind that an FUE is a procedure that can completely change your life, so manage your expectations. No surgeon in the world will work on a patient for 8-12 hours over 2-3 days for the price of $1500. Forget such offers, they are hoaxes that may lead you to pay a lot more down the road. No clinic has an absolutely perfect case record, thus any clinic making such a claim is an automatic red flag. All you can do is consider the ratio of good cases to bad cases to help make a decision. Social media and internet have connected us in ways we previously couldn't imagine, so use them to find your answers. Look at client testimonials on websites or social media and assess the photos of the results of various people to have an idea of the quality of the work done. Always ask around before committing to a clinic as personal experiences are probably the best way to know whether or not a hair clinic will deliver on its promises. You have to keep in mind that there's no guarantee even when it comes to the most successful hair clinics. A brilliant surgeon with a 99% success rate can still make a mistake but you can reduce risks by making certain choices. Go for clinics offering manual extraction of grafts, with a good reputation and experienced surgeons. That way, even if the yield of the growing hair is low after the transplant, your donor areas will still be viable for a touch up. The result will therefore not look unnatural. After you get in touch with a clinic, take your time. Find out more about them and whether or not they are a fit for you. Usually, a good clinic will not pressure you to join them quickly therefore you have the luxury to proceed at your own pace. At the consultation, you should provide all necessary information such as age, medications taken against hair loss and your expectations. You should also take good quality photos of the front, top and back of the head in order for the surgeon to accurately plan for the surgery. If you are interested in BHT, send pictures of your beard and chest hair. All this will ensure you are all on the same page and your objectives are all in line. If the consultation isn't face to face, communicate using email since this is a much more serious and secure option compared to WhatsApp. The number of grafts that a surgeon can safely extract per day is a major bone of contention. While a large number of grafts per day ensures the surgeon completes the procedure quickly, it can cost you dearly in the long run. When too many grafts are extracted, your donor area may be permanently compromised. Future hair growth is such areas will become sparse and unable to sustain additional hair transplants in case anything goes wrong. Moreover, clinics that focus on speedy extraction of hair grafts may instead damage the hair follicles through transection when they pluck them out carelessly. This reduces the overall yield of the hair transplant. The maximum safe number of grafts may vary from person to person depending on certain characteristics. Wavy or curly hair requires extra care when extracting grafts as they are more prone to damage. This can reduce the total amount of hair grafts extracted. The nature of the scalp tissue is also a factor to consider during FUE. Firm and consistent scalp tissue doesn't shift a lot during the extraction of hair follicles hence reducing mistakes. On the other hand, soft and pliable scalp tissue is a much more difficult prospect since the surgeon has to be very careful to avoid transecting hair follicles. As a result, the specialist harvests fewer grafts within a day. A good skilled surgeon can generally extract and implant a maximum of 1500 – 2000 grafts per day without damaging your donor area. For FUE hair transplants restoring substantial hair loss (over 4000 grafts), the best option if to perform multiple sessions over two days or more. This allows the surgeon to be more comfortable and reduces risk of damaged hair follicles and donor areas. There are some clinics that offer as much as 3000 – 5000 grafts per day. If anyone presents you such an offer, decline immediately. With such a high number of grafts extracted daily, the outcome is most certainly poor due to transecting of hair follicles. As if that's not enough, the overharvesting of your donor area will deny you the possibility of fixing the result later on using another hair transplant. In the last few years, technological advances have led to the introduction of automated devices that are capable of performing the FUE hair transplants. Depending on the motor used, such devices continuously in one direction or oscillate back and forth in opposite directions to quickly puncture the scalp and extract the follicular units. 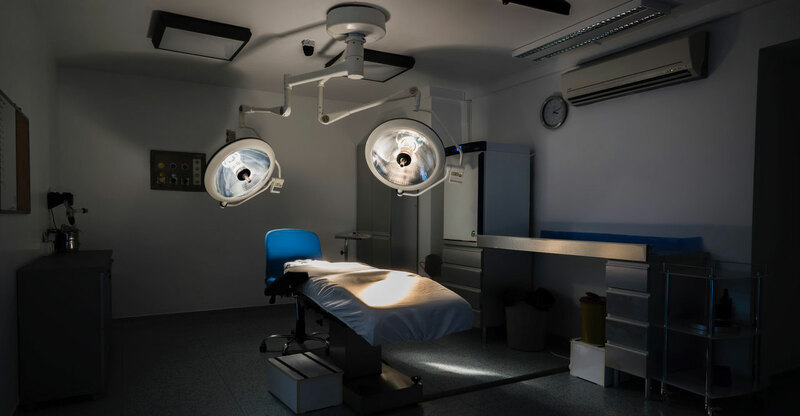 While these devices are certainly innovative and can significantly reduce the amount of time the procedure takes, there are some major drawbacks. Use of these machines reduces the 'tactile feedback' needed by the surgeon during the procedure. It's the sense that allows for a better feel and knowledge of tissue resistance and the direction and angles of the hair follicles. Tactile feedback is what gives an experienced surgeon a greater level of control during FUE for the best results. When using automated tools, this control is discarded in favour of speed. The rotating action of the machines also causes more damage to the hair follicles during extraction. Transection of grafts is therefore more common reducing the yield of the hair transplant. Automated machines can also cause larger wounds while puncturing the scalp. This is particularly true where the follicles are growing at an acute angle as seen in the hair at the sides and lower back of the head. Larger wounds lead to more time spent recovering and form more extensive scars even after you heal completely. Despite the perceived advantages of using motorised tools, we have always preferred using manual extraction. That way you will get better quality grafts. Reduced transection of grafts means a higher hair count and better hair density after the hair transplant. While there are surgeons that are able to skilfully use motorised tools, this is more of an exception than a rule. In most cases, the surgeon enjoys greater speed at the expense of quality. Keep in mind that this is a long-term surgery so shortcuts aren't wise if you have to live with the results for the rest of your life. Pick the technique that will conserve your donor area and guarantee quality results. If manual FUE will take you an extra 1 or 2 days, then that's a small price to pay. Magnification loupes are composed of one or two lenses that are connected to arms which are attached to a headband. These devices are critical for a successful FUE hair transplant. 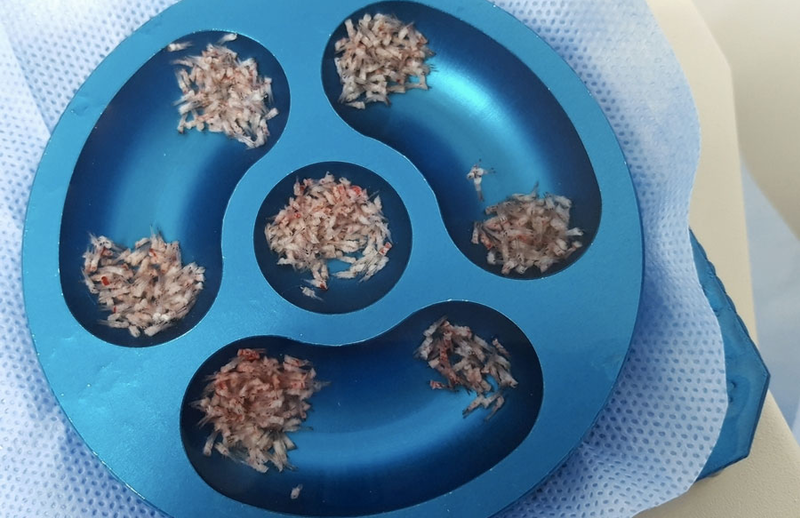 These are what allow the technician to visualise the hair-bearing tissue and extract small grafts which he/she then implants into the recipient areas. As a result, the implanted hair grafts appear more natural instead of the dreaded 'doll heads' that were the norm in the early days of hair transplantation. Nowadays, all good clinics and surgeons use magnification loupes. 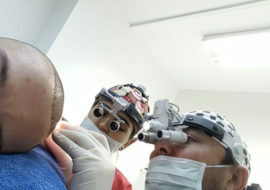 If you happen to observe pictures of the clinic or surgeon you selected showing that they don't use magnification loupes during FUE, abandon them. The same goes when a previous client of a clinic informs you that they do not use this device. That should tell you just how important a magnification loupe is. A good surgeon will use magnification loupes with a magnification of 6X. Others use even higher magnifications of up to 8X. Higher magnifications allow the surgeon to extract and implant the hair grafts with less risk of transection. The nurses that assist them use magnetic loupes of 4X magnification. This is yet another quality standard you should take note of when assessing prospective hair clinics. Proper use of these tools will ensure a greater yield and a better outcome of the hair transplant. Some clinics go a step further and use microscopes to differentiate singe grafts for implantation. This is the best way to damage the grafts as little as possible during FUE. The natural hairline is composed of single hairs hence single grafts are perfect for the hairline to create a natural looking result. As hair transplant techniques have continually evolved, so has our ability to create a completely natural hairline. That's because we can now harvest a lot of single hair grafts for implantation. Finding 200 – 400 single grafts on the donor area of a patient is possible. However, that may not always be the case. You could still use small amount of double hair grafts along the hairline. It will still look natural but only if you keep the double grafts to an absolute minimum. In the worst case scenario, you could use some transected double grafts as single grafts. The appearance of a natural hairline after a hair transplant is another way to assess the quality of a clinic. Subpar clinics are unable to properly extract and implant single grafts therefore their clients end up with unnatural hairlines which are mostly filled with multi grafts. FUE is a minimally invasive surgical procedure which grants certain advantages over other forms of surgery by default. For instance, there is a reduced risk of the complications associated with normal surgeries. That means that infection, pain, scarring, numbness, swelling, necrosis and excessive bleeding are all minor concerns. There are precautions you can take to reduce such risks even further such as taking painkillers and antibiotics. There are also some complications that are unique to FUE hair transplants. The most likely problem is the risk of transection or damage of the follicular units since they are extracted individually from the scalp. When such damage occurs, the follicular units are unlikely to grow even after they have been implanted into the recipient area. This impact the final results of the hair transplant. Another serious risk is the appearance of an unnatural or patchy hairline after the procedure. That's because the surgeon may fail to extract and implant single grafts into the hairline which makes it appear unnatural. The natural hairline consists of single grafts thus using multiple grafts gives unnatural patchy or doll-like hair at the hairline. Those who undergo FUE may also run the risk of depleting their donor areas. The surgeon may extract too many grafts which diminishes the hair density at the site and hinders the possibility of future FUE hair transplants. Hair at the donor area will then appear thin and sparse. One of the best ways you can avoid these complications is by finding a good clinic with highly skilled professionals. This reduces the chance of low hair yields. Furthermore, with proper care, the resulting swelling will go down within 2 days and healing will occur within 7-10 days. However, the situation is completely different in poor quality clinics. They may cater to as many as 8 patients per day which raises the risk of infection. Infection prevents healing at very least and may lead to other more serious problems. The yield of the hair transplant is usually low and the final result is unsatisfactory due to inadequate skills of the surgeon. For the first 10 days, wash your scalp very gently using mild shampoo twice a day. Don’t use any colouring agents, chemicals and dyes for 4 to 5 weeks. Avoid direct exposure to sunlight for 4 weeks. It is imperative that you follow such post-operative instructions to the letter, especially within the first 4 weeks after the procedure. Healing will proceed normally and the hair transplant will be barely detectable after 10 days. The transplanted hair will begin growing at approximately 10 weeks and will be fully grown within a year. In the few months following hair surgery, there may be some shedding of hair which is both normal and temporary. The hair will regrow and attain a normal appearance so that shouldn't be a cause for concern. In this period, it's prudent to visit your hair clinic to assess how successful the procedure was. If required, you can schedule minor touch ups to increase the density of the transplanted hair. We usually travel to some countries in Europe for live consultations. This is great news for those who want to follow up on their progress without having to travel all the way to Turkey. Hi I would like a quotation on hair transplant. The best article i have ever read ! Thanks for this useful information about the differences in FUE Hair Transplant ! Saw some nice posts here they are really informative and are definitely great as these are quickly updated making us in-sync with the world. I wish i have seen this article before my failed fue hair transplant in istanbul. Everything what you write here make sense and I hope to do my repair work with you soon.